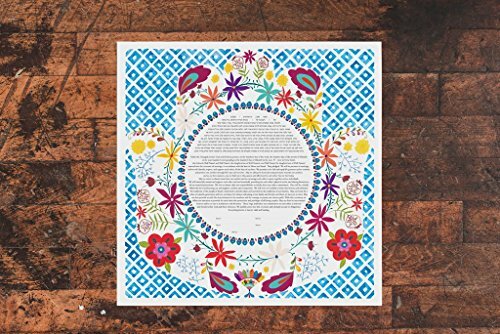 This ketubah incorporates the traditional Middle Eastern symbol of the hamsah, which is thought to bring health, fertility and good luck, with a floral design inspired by Mexican folk art. The original ketubah was hand-painted using high-quality designer gouache. It is available for purchase as: • a Limited Edition (of 50) Archival Giclée Print on natural white cotton paper or • an original 20" x 20" ketubah hand painted in designer gouache on Arches cotton paper in the colors of your choice ($750) Slight variations from this exact photograph can be expected in all hand-painted works. Please contact me to order a hand-painted original. Your ketubah purchase includes: • customization with your choice of text and personalized names, dates & location • a signed and numbered limited edition giclée ketubah print on acid-free 100% cotton rag paper or a hand-painted original with designer gouache on Arches cotton paper • an archival black ink pen for signing All ketubahs are shipped with a backing of acid-free foam core and will be wrapped and ready to sign and display at your wedding. Please allow a minimum of 4 weeks for giclée prints and a minimum of 8 weeks for hand-painted original ketubahs. If you are working under more restrictive time constraints, please message me and I will try to accommodate your scheduling needs. If you have any questions about this product by Tallulah Ketubahs, contact us by completing and submitting the form below. If you are looking for a specif part number, please include it with your message.